(http://www.MaritimeCyprus.com) MS Norman Atlantic is a roll-on/roll-off passenger (ROPAX) ferry owned by the Italian ferry company Visemar di Navigazione. The ferry was chartered by ANEK Lines from December 2014. On 28 December 2014, she caught fire in the Strait of Otranto, in the Adriatic Sea. The bodies of nine victims (three Greek, two Italian, two German, a Georgian and a Turkish passenger) were recovered from the sea, while nineteen others (nine Greek, four Turkish, two Italian and a German passenger and two Syrian and one Iraqi stowaways) remain missing. Additionally, two crewmembers of the Albanian tug Iliria were killed during the salvage operations on 30 December. According to ANEK Lines, the total number of passengers and crew, based on the ship’s manifest, was 475 which was clearly not the case as the numbers kept on changing during the course of rescue operations. Emergency authorities have finished rescuing hundreds of passengers from the Norman Atlantic, but passenger and crew lists show more people could have been on the ferry. Italy’s defence minister Roberta Pinotti told a news conference that the Italian navy rescued 427 people, bringing the total accounted for to 437. However, Greek authorities originally announced that 478 passengers and crew were on board when the fire broke out and left the ferry drifting in high seas and treacherous weather off Albania. But Italian transport minister Maurizio Lupi said it was unclear whether the passenger list released by the Greek authorities was an accurate reflection of who was on board. He said the ferry had made a stopover on a Greek island before it ran into trouble on Sunday morning. None of the statements made by survivors of the disaster have so far given any indication that as many as 41 passengers may have died. This morning DFAT confirmed that two Turkish-Australian dual nationals on the ferry were both safe and well and had been offered consular assistance. 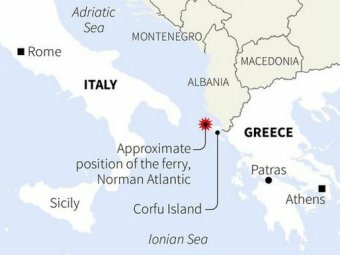 Italian navy chief of staff Admiral Giuseppe De Giorgi said military planes were continuing to overfly the area around the ferry checking for bodies. Italian prime minister Matteo Renzi praised the work of the Italian-led rescue effort, which he said had helped avoid a “massacre”. The Italian navy said the Italian captain Argilio Giacomazzi was the last of the crew to leave the ship in a rescue effort that defied high seas and freezing weather in a 36-hour drama. The Norman Atlantic was sailing from Patros in western Greece to Ancona in Italy carrying passengers and more than 200 vehicles when a fire broke out in the early hours of Sunday. It was 44 nautical miles from Corfu when fire broke out on the car deck. “It was hell,” Greek opera singer Dimitra Theodossiou said after being evacuated by helicopter. “It was very cold, terribly cold. Nearby ships sprayed water from their hydrants [to fight the fire] and we were completely wet.” She was treated for a mild case of hypothermia at a hospital in Lecce, Italy, and later released. 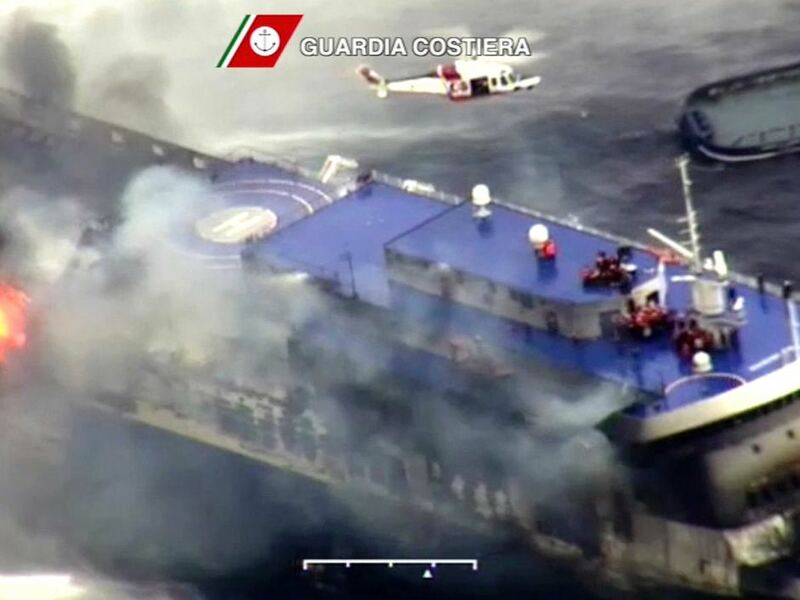 Italian and Greek helicopter crews winched more than 400 people to safety despite gale-force winds and thick smoke. Bad weather hampered earlier efforts to attach cables to the ferry for towing. Rough seas and thick fog in the area also led to the collision of two merchant ships, resulting in at least one death. Italy’s coastguard confirmed the first casualty of the disaster when it recovered the body of a man who had thrown himself off the burning ferry. Officials said most of the passengers were Greek, but the manifest included names from several other countries including Germany, Italy, Austria, Turkey, France and the Netherlands. The rescue effort involved helicopters and aircraft from the Italian and Greek defence forces along with 10 ships in support roles. Early in the rescue, seven merchant ships gathered around the ferry to act as a windbreak as firefighting vessels made their way to the scene. Out of 443 passengers, 56 crew and at least 6 stowaways, 25 passengers and at least three stowaways were lost at sea. Two crewmen of the Albanian tug Iliria were also killed on 30 December during the towing of the burning wreck. Italian and Greek authorities have both opened a criminal investigation. The ship had just been inspected at Patras on 19 December and the six serious deficiencies found, involved emergency lighting, fire doors and lifesaving capacity. Notice had been given of 15 days to remedy the deficiencies. Both Italian and Greek (Greek Anek Lines were chartering the ship) authorities are involved. There are reports that the sprinkler system emitted little or no water, but pumped out smoke, while the system’s water intakes in the hull may have been clogged with sea-life. Rear Admiral John Lang, formerly Chief Inspector at Britain’s Marine Accident Investigation Branch, has been quoted as saying: “The emergency, under freezing stormy conditions at night – challenges many of the established conventions and wisdom on how a mass rescue should be conducted…” saying that “the right rather than the convenient conclusions should be drawn”. 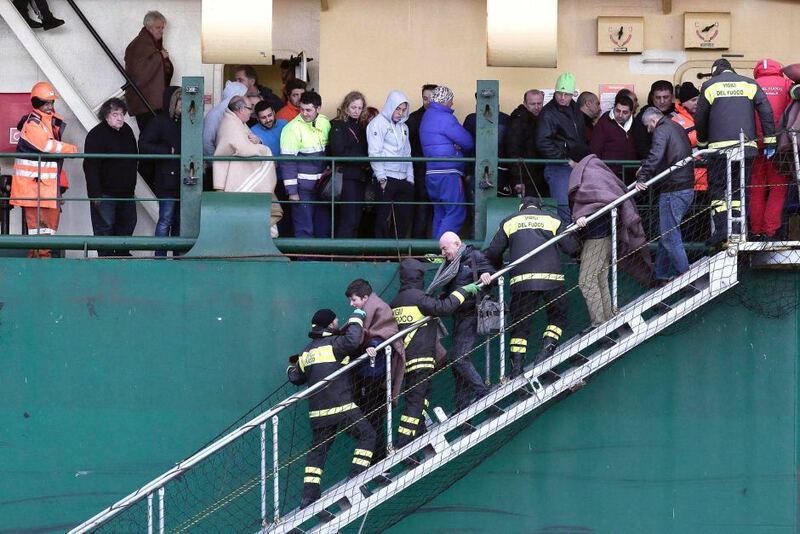 Passengers of the stricken car ferry Norman Atlantic are helped from the container ship Spirit of Piraeus in Bari harbour, after being rescued on December 29, 2014. (Reuters: Yara Nardi). Hundreds of people remain trapped after a ferry caught fire on route from Greece to Italy, sparking an international rescue mission in challenging rough sea conditions. Officials said one person has died and at least one other is injured, as high winds and choppy waters leave rescue vessels and aircraft struggling to get close enough to help. Around 130 of the almost 480 people on board had been evacuated, the majority when a lifeboat was successfully lowered from the stricken vessel, but an operation to airlift the remaining passengers to safety – two at a time – could take hours. Each air transfer was taking around 15 minutes for each helicopter, according to a Greek defence ministry official. Another official said two Italian and two Greek helicopters were involved in the rescue. Earlier, the Greek shipping minister Miltiadis Varvitsiotis said the combination of very bad weather, with winds of up to 88 kilometres per hour, and the fire made the operation extremely complicated. “We are doing everything we can to save those on board and no-one will be left helpless in this tough situation,” he said. Mr Varvitsiotis said there were 478 passengers and crew on the ship, more than the 466 originally reported. He said 268 were Greek, while a foreign ministry official said there were also passengers from several other countries including Germany, Italy, Austria, Turkey, France and the Netherlands. An international rescue effort was under way in high winds after a car ferry (NORMAN ATLANTIC) carrying 466 passengers and crew caught fire while sailing from Greece to Italy and its captain ordered its evacuation, officials said on Sunday. Passengers who telephoned Greek television stations gave dramatic accounts of conditions on the ship, which caught fire just before 6.00 am local time (0400 GMT) while travelling from Patras in western Greece to the eastern Italian city of Ancona. It was unclear whether there had been any casualties or whether any passengers were in the water, where cold winter temperatures would make survival difficult unless rescue came quickly. The Norman Atlantic, carrying 222 vehicles, 411 passengers and 55 crew, was 44 nautical miles north-west of the island of Corfu when it sent a distress signal after a fire started in the lower deck, Greek coast guard officials said. “The ship is already being evacuated,” an official said, adding that 130 people had been transferred from a rescue boat to a container ship that had been nearby when the fire broke out. Officials said both Italian and Albanian authorities were taking part in the operation, which was being conducted in difficult conditions with strong winds. Seven other ships were in the area and rescue helicopters and a C-130 search-and-rescue support aircraft had also been sent. The rescue operation is now headded by Italian Coast Guard in cooperation with Greek Coast Guard.